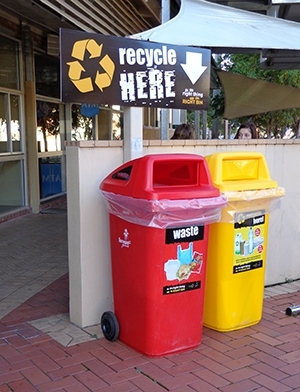 Event organisers can hire specialised bins (clearly marked recycle, waste and organics bins) and we will provide flags, banners, signage and stickers to assist patrons to recycle correctly. Through proper waste management at your event you can encourage environmental responsibility as well as cutting costs by increasing your recycling rates and reducing waste disposal fees. We can provide obligation-free quotes for any event. Phone us on 1300 87 83 87.